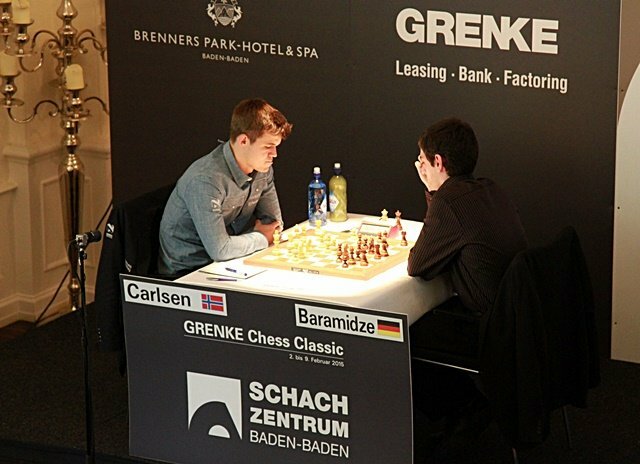 Magnus Carlsen has joined Arkadij Naiditsch in the lead at the GRENKE Chess Classic after outclassing David Baramidze in a complex ending. 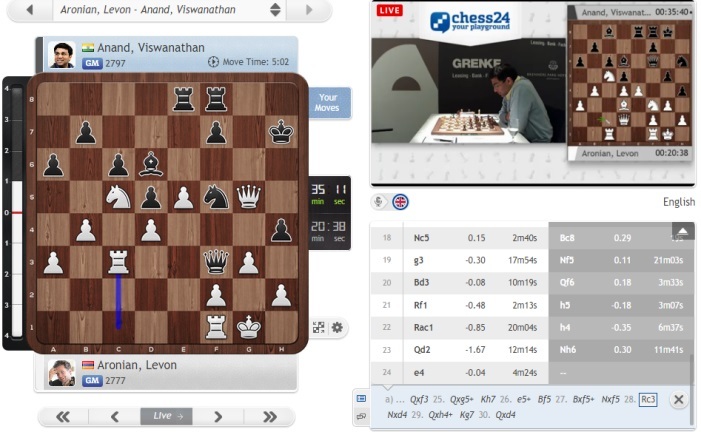 That was Carlsen’s second win and Baramidze’s third loss in a row, but the real story of the day was Viswanathan Anand’s second consecutive loss – a painfully sudden reversal in a position where the former World Champion seemed to be doing very well against Levon Aronian. 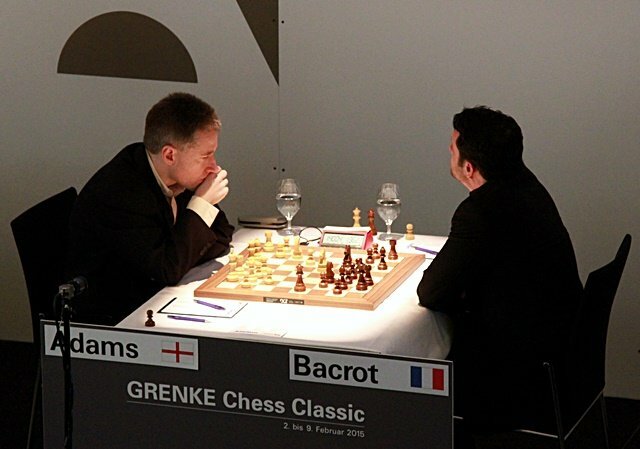 The other two games were drawn, but only after six-hour struggles that ensured the packed house in Baden-Baden got its money’s worth. Coming off a loss to Magnus Carlsen, an encounter with Levon Aronian was almost the last thing Viswanathan Anand needed. His record against the Armenian no. 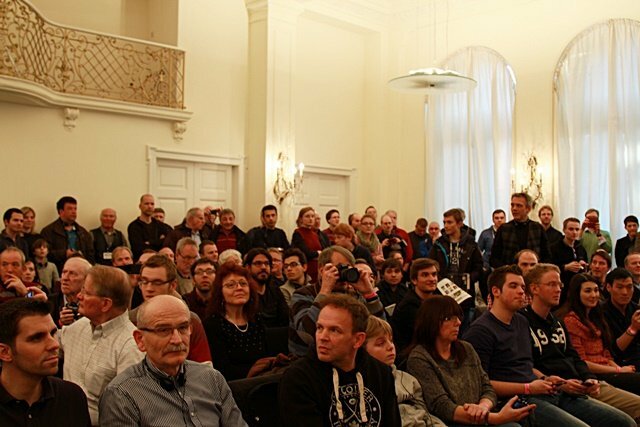 1 is surprisingly much worse than against the World Champion: 8 losses, 3 wins, 20 draws at classical chess before their meeting in Baden-Baden. The one consolation for Anand, though, is that he won the game that really mattered – their clash in the first round of the 2014 Candidates Tournament. In Round 5 things initially seemed to be going Vishy’s way. He repeated the setup Aronian had used against Carlsen a fortnight ago in Wijk aan Zee (after a different move-order the positions on move 12 are identical), but while Levon had played passively and lost a miserable encounter without any counterplay Anand expanded on the kingside with 15…g5! What Vishy should have played was 23…hxg3! when Aronian was planning 24.fxg3!? (Carlsen guessed this too: “I know Levon – he likes this kind of position!”), which would have been exciting, although objectively it favours Black. 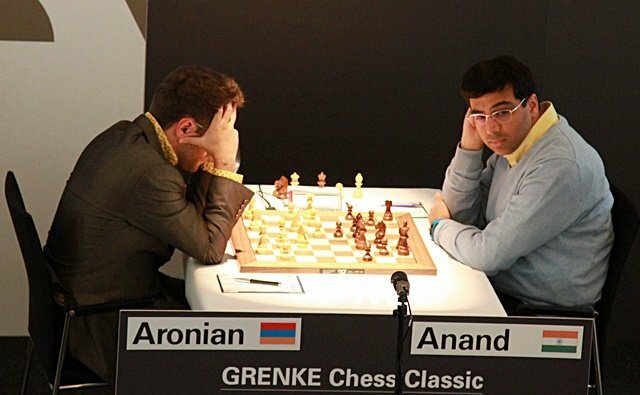 Instead Anand walked into the trap with 23…Nh6?, allowing Aronian to break with 24.e4! The consensus of Aronian and the commentators was that Anand must have missed that 24…Qxf3 25.Qxg5+ Kh7 26. e5 Bf5 27.Bxf5+ Nxf5 fails to an absolutely only move: 28.Rc3! It’s true that White not only has an extra pawn but two connected passed pawns, but as Nigel Short put it, “it’s a won position, but you still have to win it”. Carlsen felt the correct response here was 23…Nc7 (“it looks very ugly but I don’t really see anything great for me”), although after 24.Ng5! Black is losing the pawn on d6 after an exchange of queens. That wouldn’t necessarily have been worse than what happened in the game. It was harsh for Baramidze, as in the tactical sequence that followed he seemed to do almost everything right (28…Re7 rather than 28…Re6 might have been a subtle improvement, but it was a fine enough nuance that the World Champion didn’t mention it after the game). 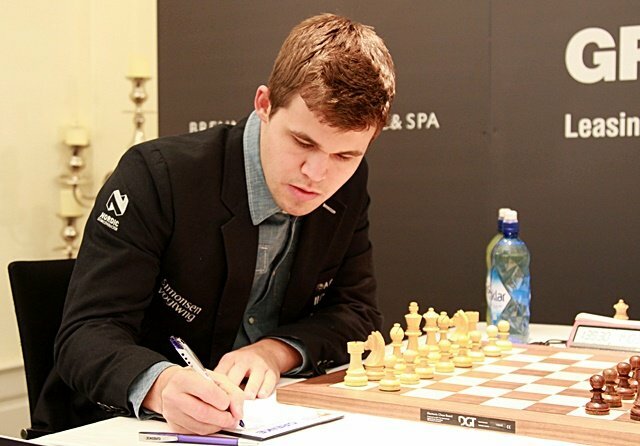 When the flurry of exchanges was over Carlsen emphasised his trumps with 35.b4! e.g. 46.b7?? Nh3+! is only a draw by perpetual check, since Kf1 of course runs into Rf2 mate. After Carlsen’s 46.Kh1!, though, it was over, with resignation coming four moves later. The remaining two games were drawn, but only after an enormous fight. I played the Marshall, which is not the most ambitious opening. I didn’t really expect to get this line… It was slightly worse and then I misplayed it and it was clearly worse... It’s nearly losing, but somehow it’s holding. I played this line myself, but I just couldn’t remember the details. Instead the players called it a day on move 65 (the same as the Naiditsch-Caruana game) after almost seven hours of play. In Round 6 we'll yet again, as in the Tata Steel Masters, get to see Magnus Carlsen face Fabiano Caruana with the black pieces. Will he manage to pull off another win, or will Caruana score his 5th classical win over the World Champion? And will the misery end or continue for Anand and Baramidze in their game? 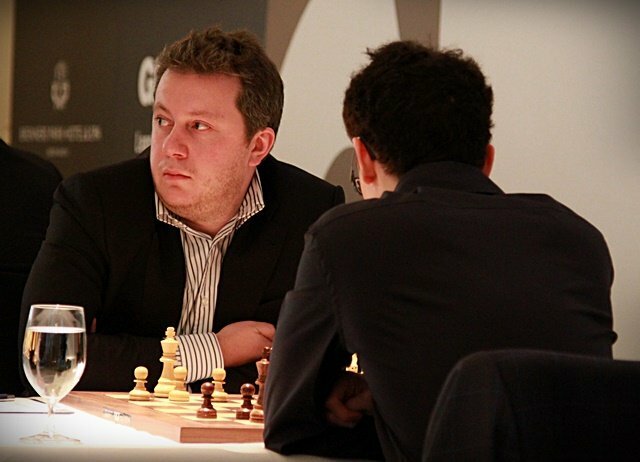 Don’t miss the penultimate round action live on chess24 with commentary by Jan Gustafsson and Nigel Short!